A Mill in Bonsall Dale. 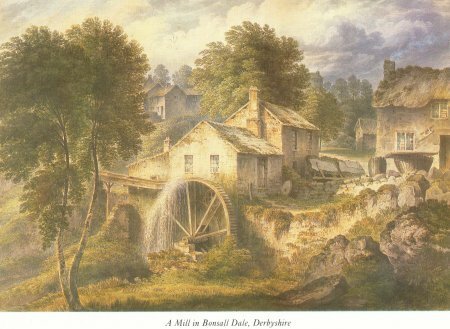 Bonsall Mill Colour Works on The Clatterway, with a 30 ft overshot mill wheel, from a print by John Glover 1767-1849. The Mill has now been rebuilt as a private house. Glover went to live in Tasmania in 1831. The date of the original oil on canvas painting is unknown, perhaps 1820.